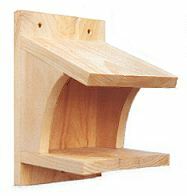 The phoebe platform for eastern phoebes and Say’s phoebes has approximately a 6″ by 6″ base, approximately a 6″ ceiling, an open front and partially open sides. Make from cedar, pine, or almost any softwood. Always use corrosion resistant screws and other hardware. Drilling countersunk pilot holes in primary and regular pilot holes in secondary work pieces reduces a tendency for wood to split and makes for easy assembly in minutes with a power or hand held screwdriver. Mount platform on the side of a garage, shed or porch under open shelter or an eave over looking both open spaces and foliage in your back yard from seven to twelve feet high. Carefully select a location that provides a balance of protection from predators and elements, access and visibility. If location is under a roof, use an open platform. Phoebes also like bird baths. Song Sparrows and Carolina Wrens may also use this nesting platform. It’s possible Robins, Blue Jays and Doves could use this platform, although slightly larger platforms are more suitable. 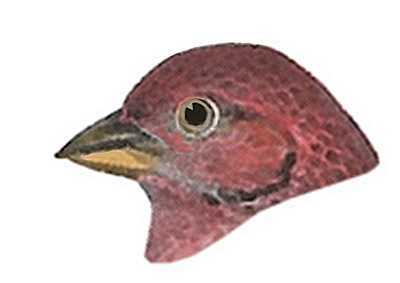 Catbirds and Brown Thrashers occasionally nest on platforms, although they may prefer an open platform placed in foliage. 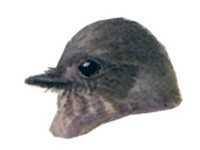 See discussion on platform nesters and individual species pages. Carefully select a location that provides a balance of protection from predators and elements, access and visibility. If location is under a roof, use an open platform.